This facial brush is designed for thorough, gentle cleansing of the face and neck. An affordable alternative to mechanized beauty brushes. Bristles are synthetic (cruelty-free). 5.25" x 1.75". 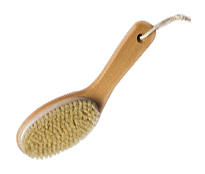 This durable body brush has soft bristles and a natural wood handle for the ultimate bath or shower experience. Note: Bristles are synthetic (cruelty-free). 10.5" L x 2.5" W.